They kicked off rehearsals this week for their hugely anticipated comeback tour. And despite plenty of drama leading up to the anticipated Spice Girls reunion, Emma Bunton has insisted everything is ‘peaceful’ behind the scenes. Appearing on ITV’s This Morning on Tuesday, Baby Spice implied any lingering drama from Mel B‘s revelation that she and Geri Horner slept together in their Spice heyday has been put aside. The lack of drama may be due to the fact that Mel B has been FaceTiming from her Los Angeles home for the first two days of rehearsals as work commitments keep her Stateside for a few weeks. 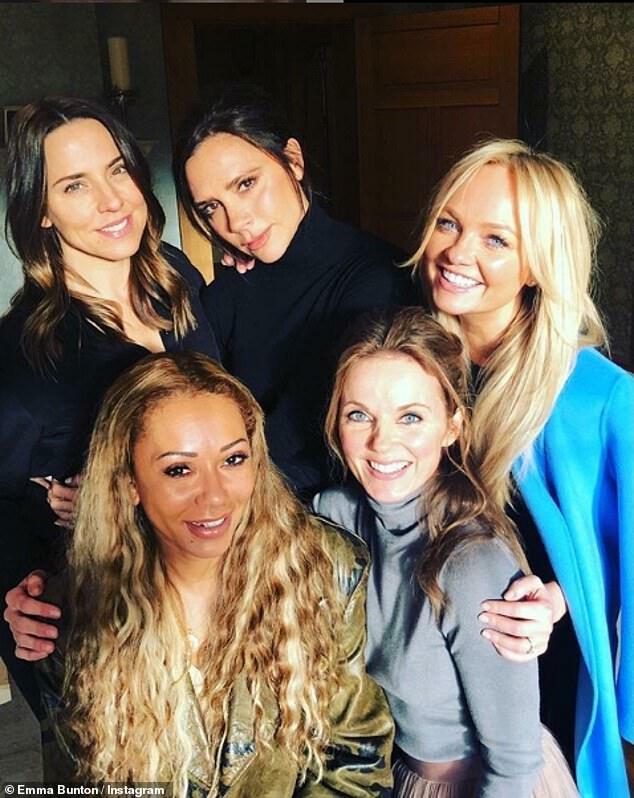 The tour was reportedly in jeopardy at one point, as Geri was thought to be upset by Mel B’s claim that they were once intimate, but Emma insisted all is calm in the rehearsal studio. ‘Being a girl band, something connects us so deeply, there’s little things that family’s do… as soon as we are back together, it’s like kids at school,’ Emma explained. Aside from reuniting with her bandmates, Emma has also been working hard on her new solo album, My Happy Place, which saw her reconnect with another nineties pal, Robbie Williams. The pair duet on a rendition of 2 Become 1 for the album, but Emma admitted the two had some unfinished business to sort out before they started recording. ‘He’s always said it for years, he has said he has had relations with four out of the five Spice Girls. Which is not true, I promise you, I promise!’ she admitted. Emma also duets with her husband Jade Jones on the solo record, which she said was a magical experience.